I just LOVE the scams made by people that know absolutely nothing about the field where theywish to rip off investors. hastly throwing together some webpage ..
MTOW: 1.8kg , specified battery : 6s 42Ah ! - I guess >5Kg of battery does not need to fly any more than any other part of this deal. 42000mAh was certainly a mistake, fixed to 7000mAh. I would appreciate if you could sign-up to the newsletter and bear with us through the test campaign. I'm looking forward to your comments. I can't properly evaluate your bird due to a lack of information on it. But one thing that did catch my attention is your Drone Killer, lots to say about that. First would be that is has a 20W output? You will need a license from the FCC to pull the trigger as it is transmitting in public and unshielded. Max legal is 1W depending on what you are doing with it. Another problem with these types of products is that they deny someone communications. That is specifically illegal. It is a military application only and giving that ability to civilians will result in misuse. Another point would be that if you brought my drone down in a crowd with one of those, who is responsible for the possible injuries it WILL cause? We are talking about possible death here. Another point about jamming my drone, how do you know I'm not using it as part of an official government organization such as police, fire or search and rescue? If you brought it down are you responsible for replacing my fried electronics and damaged props? How is the use of your product any different than a shotgun being used? Do you want to be the one that activated your product on a drone searching for a missing child? I can't tell you how much of a bad idea these jamming devices are. My view on these types of things is to let the military use them if they can, don't sell them to the public or develop one if you can not control your liability or the actions of others that would use them. Thank you for your comment. I fully share your concerns. Drone killer is certainly available to autohirized organizations ONLY. This is probably the 5th or so 1 hour claim on a quad-copter I've seen. Almost always requires no payload, no movement, no wind, and running the battery down to critical conditions. Or is using fuel-cell's or non-lipo batteries that require current draw to be extremely low, and again, not practical in real world conditions. There are tons of V-TOL UAV's that can do 1 hour of real world flying (mapping or actual work) in the traditional heli realm. More flight time is great, but, if you need something to just hover for a long time there are tethered options that allow for unlimited hover in one place. If you need an hour of actual work with a payload, Traditional heli's are far better and more reliable than quad-copters. We will see if this can actual do an hour of actual real world work, if not, it's just another quad option with the literally thousands already in existence. Thank you very much for your valuable 'to the point' feedback! The measurement is surely done at indoor hover conditions. Though, without putting the batteries in danger. We use standard Panasonic NCR18650B batteries. As you may have seen on the website, we're working on an ultra light electric motor which hopefully will be the ground breaking contributor to even longer flight times. This model: TC411 is a demonstrator of 1 hour flight time with OTS equipment. We currently plan to offer this product for arround 3000€. About the other 1 hour flying drones, I wonder if there are any at this price range? 1000gram of battery and 500grams of "funny frame" + 4xmotor + "funny landing gear" and so on (not to speak of those cute little propellers). 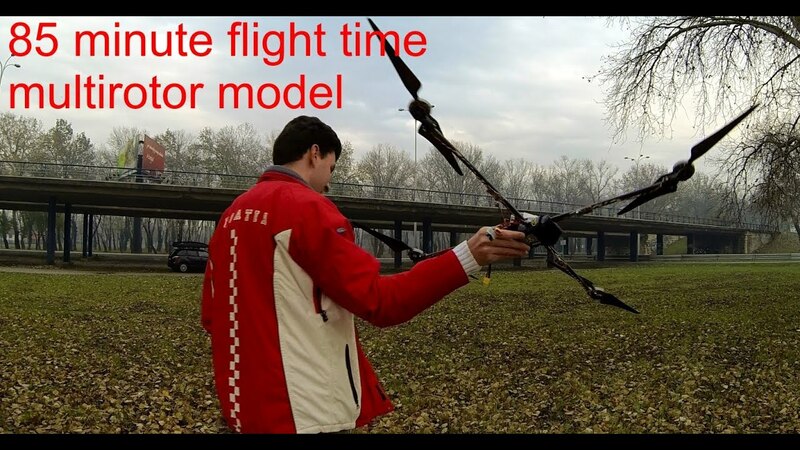 There are drones with 1 hour of flight time. It is easy to recognize them as extremely minimalist slim design and gigantic propellers. Each part is absolutely the best in its kind, battery pack is often 500USD. You got this right Hans, bigger the propeller more the eficiency. We use 11" props to hover our super cool weather reistant airframe for 1 hour. The battery pack costs arround 150euros. If you are ready to pay I would suggest you use Kokam batteries for arround 1350euros. The hexa I build fly for 34 minutes with 1050 grams of payload . It can fly with rain and has a rail for rapid gimbal change. Without payload but standard batteries the flight time is 56 minutes. The quad (870 grams without battery and payload) with 250 grams of payload fly for 50 minutes . Using 18650 batteries would extend flightime but since the C rating is low it would not be possible to have a significative payload .